The last reservation of this item will conclude on June 18. For rentals that require shipping or a pickup at a non-headquarter location, please select a later date for your arrival. Headquarter offices are the only locations that can accept a same-day reservation, as transit time is not calculated in this date. 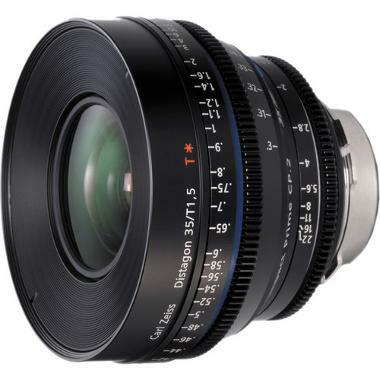 The Zeiss CP.2 35mm T1.5 MFT Mount Speed Lens combines the sharp resolution, high contrast, low distortion and perfect color rendition of Zeiss with the cinematic features of professional video lenses. It features a 14 blade iris, a bracketed manual focus ring, and a longer focus rotation that's suitable for cinematography. It also exhibits great flare suppression through T* anti-reflex coatings and internal light traps. Its primary advantage over the other 35mm lenses in the CP.2 collection is its wide maximum T-stop, which gives it the "Speed" designation. The standard focus and iris gear positions, along with a robust and reliable cine style housing, makes this lens ideal for any production. • This lens is manual focus only. It can be used for photography but is designed specifically for videography. • Compatible with Micro Four Thirds mount cameras. • Minimum Object Distance: 12"